He didn't really like balls, didn't really like tugging, but he sure did like to herd other dogs. Plus he was very sensitive to negativity -- one time he scraped a carpal pad (no blood! just a skin scrape) on a prop in front of the box and promptly went into the kitchen and lay down on the floor. Game over. It has been a challenging and entertaining three years but the payoff is finally in sight...he is now able to race in a tournament setting, his box turn has held up without props, and his drive has really turned on. He's a giant giraffe of a border collie barking and spinning and lunging in the lanes ready to go. Here's how it played out this past weekend. I would eagerly wait till it was our turn to run, then let him go and watch him race down to the box, execute a happy-snappy turn, then run back to me (TO ME! Yes!!) -- and then...wait...where's the ball...my heart sinks a little bit...crap. Where's the ball?? I tried to stay really positive and upbeat (because he shuts down if you don't), gathered him up and sent him back down for the rerun (if there was time and if it made sense). His ball made it over the line about 50% of the time. When it did, there was a party in the runback. Krak had to be clicker trained to even pick up a ball, so it's not like this ball dropping thing is a huge surprise. A while back my friend Barb kept him for a long weekend when I was at the beach (Barb has Kraken's brother, Twyst, so she has a soft spot for the big goofball) and she worked a lot on it. She put the ball in a nice stinky chicken treat bag and left it in the refrigerator in between training sessions, and worked tirelessly clicker training him to first acknowledge it, then pick it up, then bring it back to her. Later she was also the one who put the ball in the box and persuaded him to get it -- before that he would just do a box turn and let the ball shoot past or hit him in the head. So the fact that the dog now runs down to the box, catches the ball and brings it even partway back is a huge deal. I'm proud of him for that much progress. And for the past few months, my priority has been getting him to run the pattern and come right back to me instead of looking at any other dogs running by, so I've been rewarding his focus above everything else. But it's time to take it to the next level. This weekend when I raced him I used a squishy ball for max catchability, left the tug on the floor in the runback so that he couldn't even see it, and stopped calling him at all while he was racing because as soon as I did he spit the ball. I still ran away from him when he was on his way back, though, which was probably a bad idea. I have another dog who occasionally spits the ball right at the line when she gets tired. When she does this, I use what we affectionately call "The Potted Plant" method (coined by my old teammate Jenny), which is essentially letting her go, then staying waaaaay back in the runback and facing her while clapping and calling her name, but not moving my legs at all and not reaching for her frisbee (tucked in the back waistband of my pants, where she can't see it). That works really well most of the time. But Kraken isn't spitting the ball at the line. He's spitting it at the box, or in between jumps. So this week I embarked on a "Bring it" campaign, where I am teaching Kraken to bring the ball to my hand. Every morning I sit with his bowl of kibble on the couch, roll the ball around the room, then click and treat him when he brings it close enough to my hand that I can touch it without getting up. I'm working up to having him put the ball right in my hand. It's tedious, but I'm really motivated now...he ran a 4.2 this past weekend from 30 feet without a tug or me calling him. 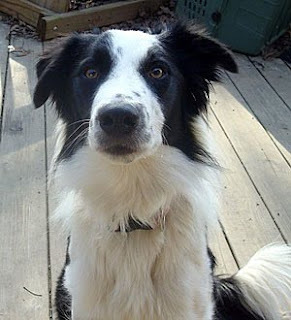 I really really really want to be able to run this dog in a way that will let me be really exciting in the runback area -- running, calling, dragging his tug, etc. If anybody out there has had success fixing a spitter, I would love to hear about it. Lisa you are doing what needs to be done. Teaching him to bring it to hand. I know some folks will let the dog get away with touching them and then dropping the ball which may also work since you want him on the tug. I have started teaching my dogs to bring to hand from the time I start working on the retrieve and it does seem to help a lot. Kraken can do it. We had a spitter. I clicker trained him to retrieve the ball (had no ball interest), but he would still drop about 1/2 way back when in the lanes. he's a pretty soft guy (so soft at the beginning, that a "no reward" was devastating) so i knew i couldn't teach the "to my hand" thing to him, because he wouldn't see it as fun, and would shut down. instead, i didn't make a big deal when he spit (but had a party when he brought it back) and we started playing the "go get it" game. The object of the game: to bring any item (not a ball) that interests him back to me. So here how we play: we’ll be playing with a toy, tugging etc, I’ll disengage from the play, and he’ll play on his own for a sec and then drop it and come back to me, (I am the potted plant) then, I’ll get excited and say “go get it!” and point at he object we had been playing with. He will go get it, and I’ll say “bring it!” if he bring it back we’ll play again, if he drops it, I’ll repeat the “go get it!” “bring it” combo. Despite not ever playing this game with a ball, he soon began connecting the dots, and he is now no longer a spitter! I think this method worked because I wasn’t stressing about the ball (which he doesn’t naturally like) because I didn’t want him to make any negative associations with it. I don’t know if it’ll work with your kid, but it’s a different option! Can't wait to see how this week's campaign turns out! Good Luck! These are great comments, guys. I worry a lot about making "bring it" an obedience exercise and taking some of the drive and fun out of Kraken's recall. I really don't care if he brings the ball to my hand or not, as long as he brings it over the line! Right now i'm just trying to make him understand (with this breakfast for ball clicker training exercise every day) that the ball is important... I like the idea of playing with the ball he brings back, and with taking his tug away (or leaving it in the runback) if the ball doesn't make it back. Hmm. You don't have to make bringing the ball an obedience exercise. You can still clicker train and make him want to do it. I don't clicker train but I use the cue yes. This allows both hands free to play. Play like you use to with Cho in the runback. She loved the game and Kraken may enjoy that game. We have three dogs on our team that had to be clicker trained to work the ball. My dog, Derby, hated balls with a passion. Before training, he'd actually turn and run away at the sight of a ball (hiding behind my legs was his favorite). He detested the things. So, I set about to clicker the retrieve. We started with just looking at the ball, then nose-touching the ball, then putting th ball in his mouth, picking up the ball from the floor or elsewhere, chasing a ball, and finally bringing the ball to my hand. No ball in hand, no cheese! That's how we trained it. Once in a tournament setting, I had to sit on the floor the first dozen times or so with my hand out to get Derby to bring the ball back to me and not spit it earlier. Now, not so much. He's got the idea. He brings it back pretty much until I turn around or begin praising him in earnest. He's got a wonderful retrieve. As far as killing enthusiasm, Derby's more excited now about the ball than ever before. He loves the clicker game. He gets excited by it and turned on - especially since he understands the exact rules. He likes balls, well sorta (he only likes his special squishy baseballs). And, I can yell, run, clap, and act like an idiot in the runback without Derby dropping the ball or slowing down. In fact, he speeds up and still holds the ball. As an aside, I'm currently training my tennis ball obsessed monster to retrieve a squishy ball to hand. She is loving the clicker game as well and has caught on very quickly. She gets all wiggly whenever I get out the ball and clicker. 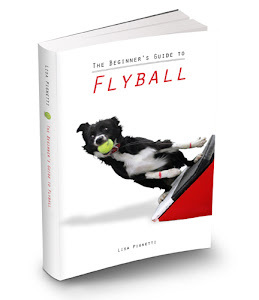 I have a dog that loves flyball, but she too will spit the ball somewhere before the last jump or just before the start/finish line. We had a major accomplishment in a Jan tournament warm-up when she dropped her ball BUT remembered to go back for it WITHOUT being told (this was huge!). At home, my problem is this...she will bring the ball within 4-5 ft of me and drop it. When I indicate I want her to bring the ball to my hand she will oblige by bumping the ball with her nose rolling the ball to me! She's smart. She's giving me 'what' I ask of her. I just need to change the 'how'. I think the best way to deal with it to set a clear criteria for where you want the ball, ideally in your hand. Jynx, my Manchester Terrier, would love to leave his ball at the box. He, too, is not a natural retriever and could care less about a ball outside of getting it for me for a treat. He also spent a lot of time hitting a box with no ball and is fine to run down and just do that. We really had to work with him with a "in my hand" command. It's the same thing we have been doing with Wii Whippet. In actual competition I am loose with it and it just means that you have to have the ball in your mouth when you are in the air coming for your toy. I think another problem is that we inadvertently reward the drop. Yes, we all had a party when Kraken carried the ball over the line... did any of us pay attention to whether we all said "Yay!" right as he dropped his ball? Sometimes I don't think we notice stuff like that because we are so excited that it was over the line. "Over the line" is a bit too vague of a criteria in my opinion to expect a dog to do. I like a nice, clear expectation for the dog. I know I'm way-late in posting this comment, but if you're still reading, Lisa, here's what worked for my dogs. When training with them in the house, once they got their ball or just before they got to the ball, I'd call their name & run into a different room so they could not see me. This forced them to come and find me before dropping their ball. If I couldn't make it into another room, I'd hide on one side of the kitchen island or crouch down behind one of their dog crates. Just somewhere they could not readily see me. In the beginning if they didn't carry the ball all the way to me in the other room or where I was hiding, I'd tell them "bring". I think it only took them 2-3 times of this exercise and they got it. I imagine you could also try it at group practices if you have an adjacent area to hide or by hiding behind something or someone. Chiming in very late, both my girls are minor spitters. Both have fantastic play retrieves, all the way to feet or hand. I have tinkered and tinkered with it. Interesting thread.